Ok, we’ll see how this goes. Once upon a time I was a VERY A type personality. Since leaving the corporate world and rediscovering my sense of humor, I have also become a bit disorganized. All of which I am OK with, I’m just hoping I can keep this together for the duration of the year and continue with this project without fail. Now that my disclaimer is out of the way, I am happy and ready to share :). Far from being my colors, I already knew I wouldn’t recreate it in drab greens. 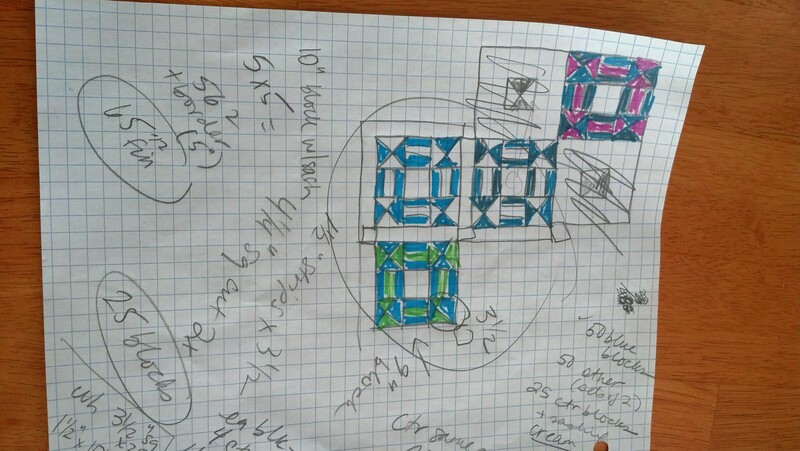 I also knew it would be MUCH scrapier than this example, as she used the same fabrics for all her rectangular blocks. I began to look through my blue scraps to see what I had. Then I started to wonder if it might be more exciting with even more color to it. While I was drawing and coloring, I was thinking this would look too busy, and maybe I should add an alternating block – white outside with a 4 triangle center. Then I thought, maybe I should sash it and add blue cornerstones instead. I love sashing. So of course, that’s what I went with. 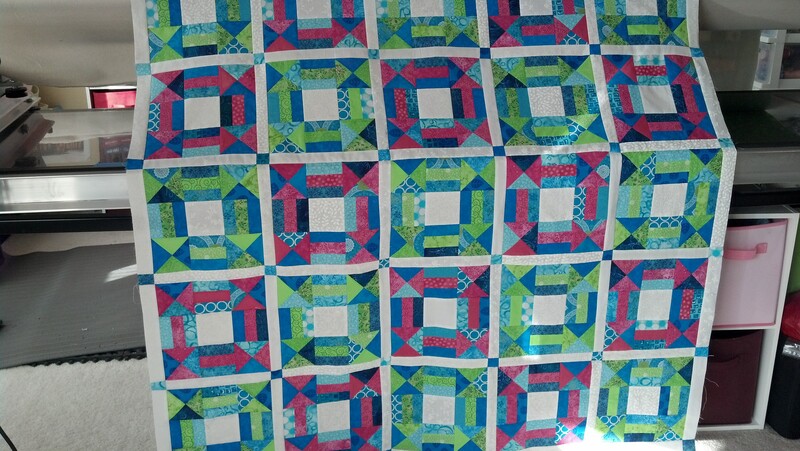 I also decided for color placement to keep the center’s of the squares white, as well as the sashing, and the remainder of the blocks parts to be made of turquoise/bright pink and turquoise/lime green. 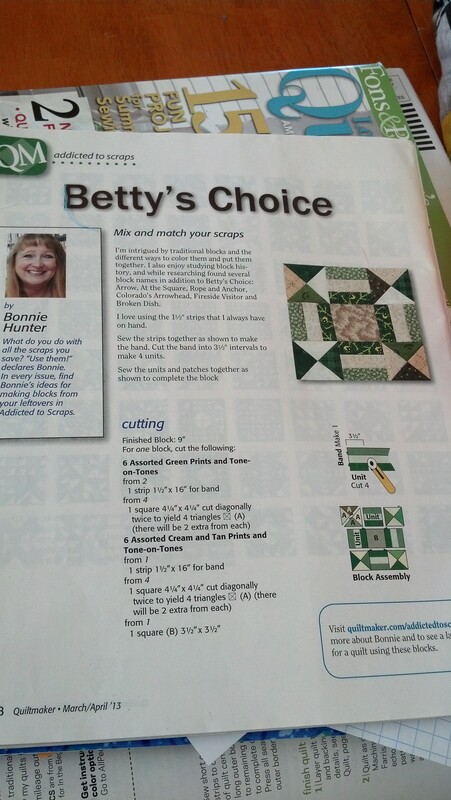 The block in the magazine shows 9″ finished, so I decided to make the quilt 5 blocks across by 5 down, 25 total. 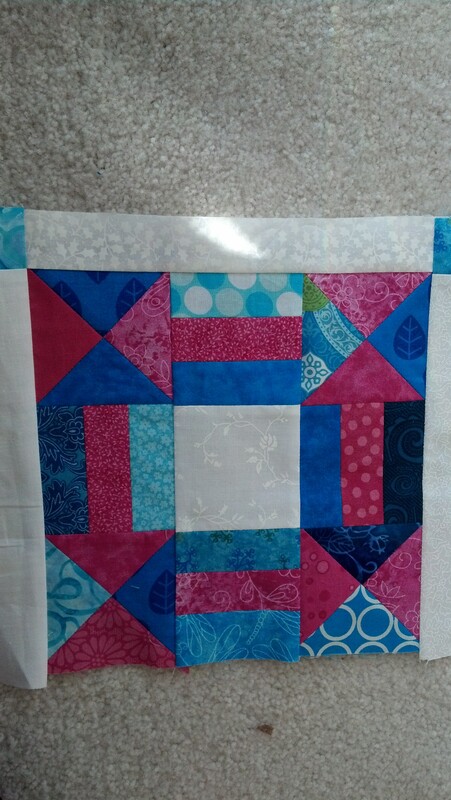 With the sashing and a border, I thought that would make a nice lap sized quilt. I set them every other block. I waited to decide on the border until the next morning. 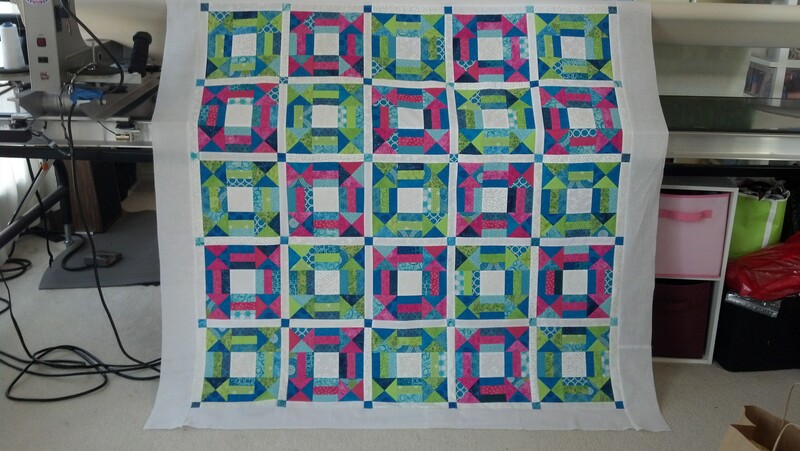 Overnight, I had a thought of doing a triple border, each strip the width of the sashing, but in the pink, blue and green, from the same fabrics the blocks were made. 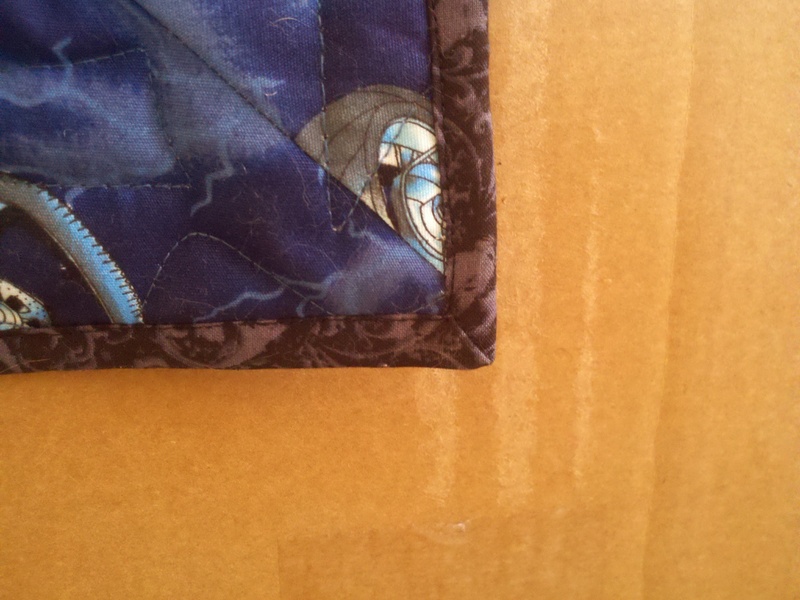 But when I held strips up to the quilt hanging there over the back of my longarm machine, I didn’t like how it looked. Before I do things like borders, I put a strip of what I’m thinking along the edge of the finished portion and take a few steps back and squint. Yes, squint. It just works. I considered for a bit not adding any border, but I ALWAYS add borders. 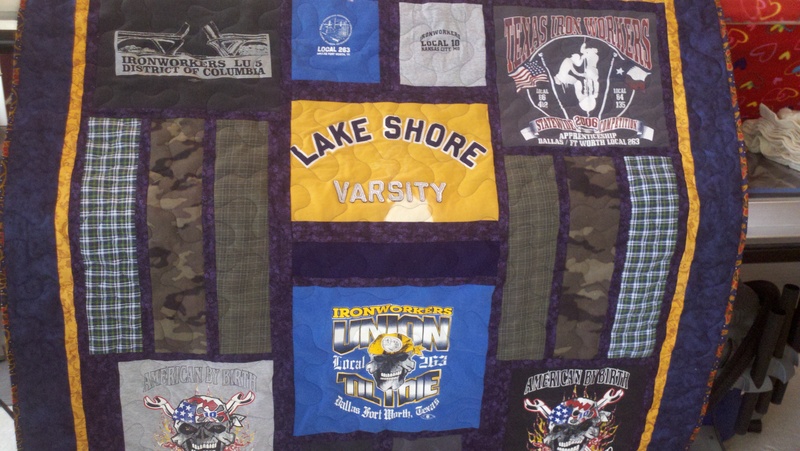 As a quilt appraiser, I can tell you that borders not only frame a quilt and finish it, they add value. So I looked at a strip of green, and then a big strip of pink, didn’t like either, so I decided on a solid white border. 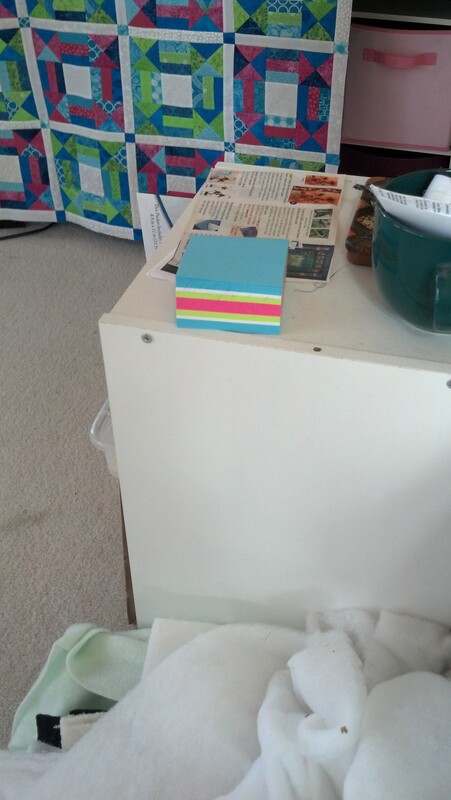 Then I looked over at my table and realized, maybe this had something to do with my color palette inspiration! Part 2 of this project will be making a block, or perhaps an entire quilt (I suppose an entire quilt would better showcase what it is I’m trying to do here), differently. When I was finishing up another quilt, I found some purple and white tie dyed fabric. I thought maybe I will make the next quilt from that alone. Or maybe all purples and white. 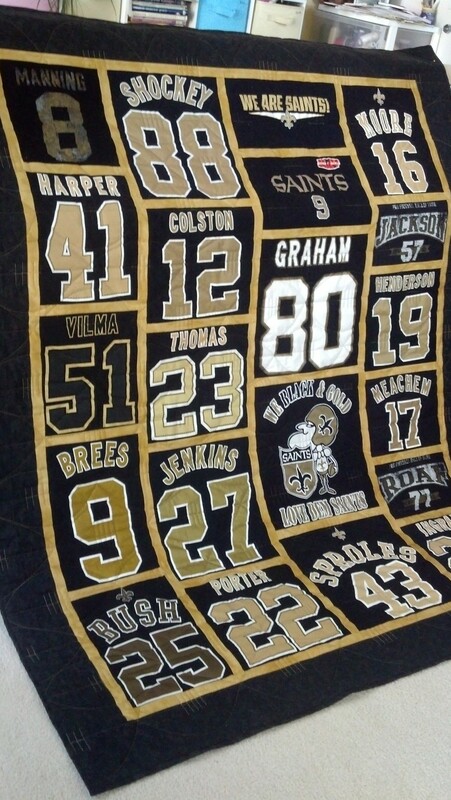 One month I plan to do it with black instead of white/cream as the offsetting color. 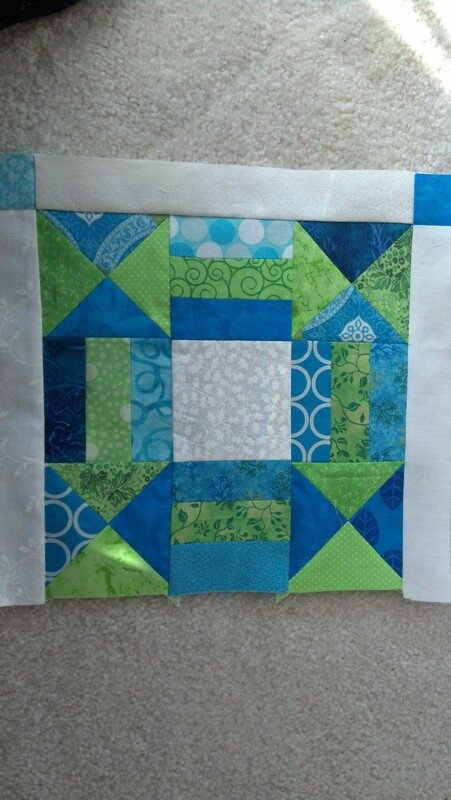 I will likely do one in fall colors, mixed up though, not separated by blocks. I should probably do one set on point, and perhaps one month I will do the alternating block idea. So THE PLAN is to continue this project every month, and the PURPOSE is to show how different a quilt can be and look based off the colors and setting chosen. And the secondary purpose is to infuse you with creativity, inspiration, and the empowerment that YOU can really do this with almost any pattern! You can make it what you want, you CAN make it different than what the instructions tell you. It’s kinda fun to not follow the rules sometimes ;). I haven’t posted to this blog in a while, but I have been blessed this year with a request I spoke late last year, whether I really meant it or not. I prayed that my business would prosper, but that this year I might have time to be creative and do my OWN projects as well. Actually, I did mean it, because I was SO busy last year I truly did not have time to do anything ANYTHING but quilt for others. Don’t get me wrong = I LOVE quilting work that others bring me! But sometimes, just sometimes, I want to be able to make something. Create something from scratch. I believe I have been given that very opportunity. Funny enough, I finished up my holiday deadline projects right before we left for Christmas celebration with family in Memphis. I had time to put together a scrap quilt, and then had no business. To clarify, no business due. I did have a few quilts brought to me for the coming year, nothing in a hurry though. So I quilted a charity quilt for the guild, and finished two O L D projects TO COMPLETION (yay me! ), which is unheard of in this house. Then I started another project with scraps. 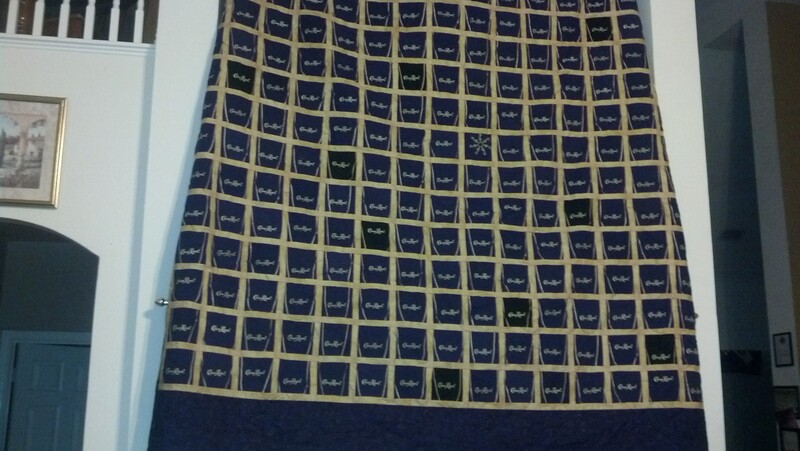 This week I decided to get all my quilting-for-other-people work done. 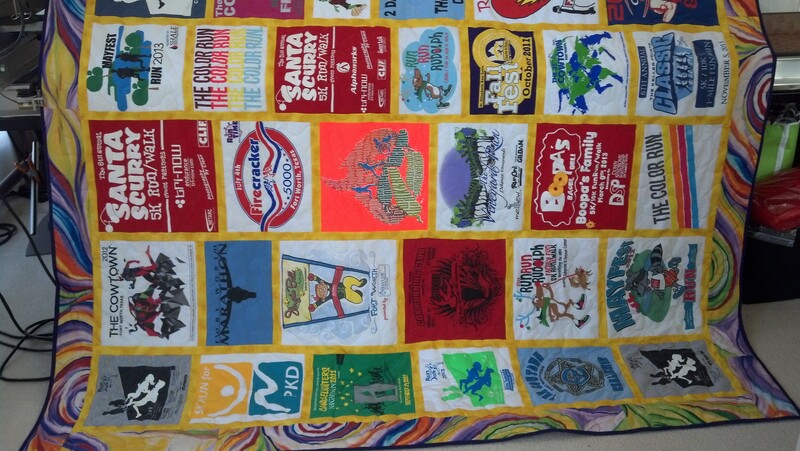 I have one task I don’t want to do – I have to tell a client I can’t do her quilts. She asked me to follow a pantograph. I don’t do pantographs. I found her someone that could and she said she wanted me to try to freehand a design like it. 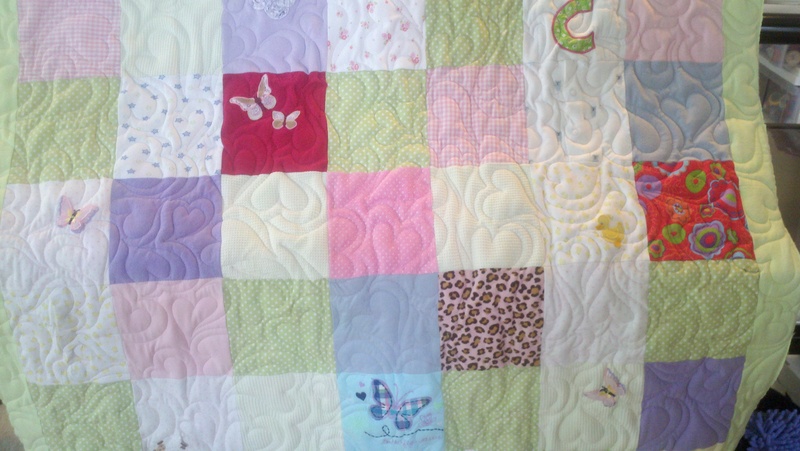 I tried (on that charity quilt), and it was AWFUL. Which means I not only have a limitation, but I have to admit it to someone else. sigh. Anyway, the next post you will see from me will be soon, and it will be regarding this last project using scraps. I found a block pattern in a magazine and sort of modified it to make a top, which I finished the center of today. I still need to decide what to do for the border. But I’m thinking I can take the concept of this block and play with it with different color combinations, different shades and batiks vs. conventional prints. What I’d like to do is showcase this each month, to show how DIFFERENT the same exact pattern can become with very small changes. I don’t want to spoil all the fun with pictures and everything, but this first time around I took the block and used different colors than suggested and put in sashing and cornerstones. That’s one of my favorite ways to make quilts – it really separates the blocks and relieves the potential for muddled confusion of too much altogether by giving your eyes a break.